Caramel Wings: Two Recipes with Dal! Dhokla and Mulligatawny Soup! Two Recipes with Dal! 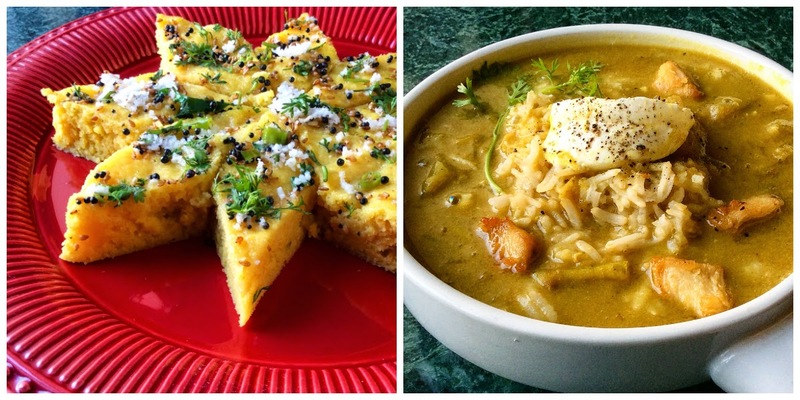 Dhokla and Mulligatawny Soup! 1. You do not need to use a lot of water while boiling vegetables. The idea is for the water to just cover the vegetables in it. Instead of pouring out the water, you can use that flavourful Vegetable Stock in place of water while cooking your next meal! 2. Don't use water to defrost food. You can just leave the frozen food in the fridge overnight instead! The good folks over at Tata I-Shakti have taken a great initiative during this #WorldWaterDay to make everybody aware of these little things, while also talking about their wholesome unpolished Dals. I have made the switch recently, and I could not be happier. Not only does 1 cup yield more Dal as compared to polished Dal, these Dals only require 2 cycles of rinsing as opposed to 4 times with the regular polished variety. Not to forget that the Polished Dals also are stripped off of their nutritional content. On this blog post I will be sharing 2 recipes from my kitchen, that waste minimal amount of water. First one is a healthy take on the globally favourite Dhokla, which I have been making with Moong Dal off late. Not only is this healthier, I have used the soaking water to blend the soaked Dal, instead of pouring it down the drain and replacing with fresh water. The second recipe has a story of its own. It is the world famous Mulligatawny soup. Mulligatawny soup comes from Mooluga Thanni, which literally translates to Pepper Water. It was served to the soldiers during the British Raj in India, just because they demanded there be a Soup course. Well, the British left, they took the recipe with them, and heavily anglicized it to suit their palate. They added meat to the soup, thickened it with Coconut Milk, but I am not complaining, for I am a huge fan of this dish! It may be a bit lengthy but it is really easy, and the final product will blow your socks off. I guarantee it. So, without further ado, I present these two recipes to you, one by one! Takes 20 minutes plus 4 hours soaking time. 1 cup Tata I-Shakti Moong dal. A handful of Coriander leaves, chopped. A handful of Grated Fresh Coconut, scraped. Soak the Moong Dal in 2 cups of water for 4 hours. Drain it but reserve the water. Grind it in a blender with the Chili and Ginger. Use the reserved water (add more if desired) to get the pouring consistency like that of a Dosa. Set up your steamer on the stove. Grease the steaming plate with Oil. I used 2 flat plates. In the mean while, mix in the Turmeric, Red Chili, Asafoetida, Salt and Oil and give it a good stir. Just before adding into the steamer, add in the fruit salt and mix well with a steel spoon such that the batter is fluffy. Pour it into the two plates and set them in the steamer. Steam for 12 to 15 minutes, then turn the heat off and let it stay for another 2 minutes. In the mean while, make the tempering. Heat up a small pan with the Oil. Add in the mustard seeds, when they pop add the Asafoetida and the chopped chilies, followed by sesame seeds and then curry leaves. Let them splatter. Top this up with water and Sugar if desired, and let the mixture come to a boil. Turn the stove off and keep this aside. You can choose to skip the water soaking step, but I like my Dhoklas moist. Remove the Dhokla from the steamer and cut them into desired shapes. Soak them with the water from the tempering, and add the tempered goodness all over them. Garnish with Coriander leaves and grated coconut. Serve with chutney! 1 Green Apple, peeled and diced. A dollop of Yogurt, to garnish. Soup: Heat 2 tbsp Oil in a deep pan over medium high heat. Sauté the Ginger, Garlic, Onion and Jalapeño until the Onions are translucent. Add in the Apples and give them a minute, then add Coriander Powder, Cumin Powder and Turmeric Powder and stir till the masala blooms. At this point, also add in the Stock Cube if you're planning to use one. Top up with Water/Stock and pour in the Red Lentils. Let this come to a boil. Turn the heat to medium low, cover the pan and let this go for 30-45 minutes, until the Dal gets cooked. Throw in the chopped Coriander leaves. Purée 75% of the ingredients to a smooth velvety goodness, while letting the remaining 25% be chunky, for a superb textural contrast. You'll thank me later! Return the soup to the pan on a low heat, and add in the Coconut Milk. Give it 3-4 minutes, then season with Salt and a generous cracking of Pepper. To Serve: Place a small handful of boiled/cooked Rice in each bowl, and top it up with Soup. Garnish with a dollop of Plain Yogurt. You can also add a squeeze of Lemon Juice. People also serve this 'best-soup-they've-ever-had' with pan fried/roasted Cashews or Almond slivers. I'm salivating already. Nice blog !! thanks for sharing the information of Recipes with Dal! Dhokla and Mulligatawny Soup! i was looking for blogs related of FSSAI Certification this blog is really nice and interested to read. I need a recipe for my pressure cooker, hope you can help me.